I'm sure you've already started your holiday gift shopping. Here's the Frisco Kids holiday gift round-up, which includes a lot of locally-owned businesses. 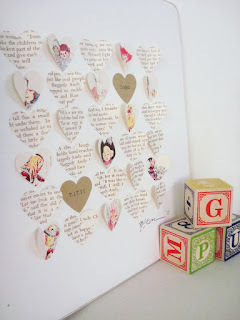 Think of this as a craft of the month club - a great gift for a grandparent to give, or even you (a time-strapped, or noncrafty parent). Bay Area mom Sandra Oh Lin came up with these very cute Kiwi Crates. Each has a craft with all the supplies (including scissors! ), wrapped oh-so-prettily (trust me). 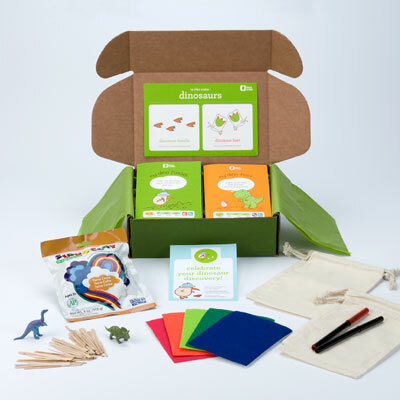 Theme-based crates might be arts/crafts, science (fossils, dinos), gardening, imaginative play, colors/lights or others. They're gender neutral and have instructions and all materials for at least two activities. And yes, they're educational and all that good stuff. At $20/month (including shipping), it's quite reasonable. Plus, how much fun do kids have looking forward to and receiving a package in the mail? Looking for a great baby gift, or a way to use your child's artwork in an original work of art? Check out Celadon Home, art made by Michelle (she also does Christmas, wedding, anniversary, bridesmaid and other gifts). She takes art work (or books, photos, invitations...) and turns it into another type of art (see below). She does a beautiful job and is detail oriented. Disclosure: the artist is my cousin, but her work is so beautiful I had to share it here. You must order by December 8 in order to get gifts in time for Christmas. 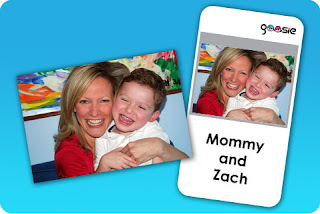 These personalized Goosiecard flash cards are great for little ones. Teach the alphabet, names, family members, any other words you want your child to know. The cards are high quality, and are spill-proof and tear-proof. You choose how many you want to make (10 card minimum). You can use their stock photos too, so you're not stuck if you're a bad photographer! Choose from their signature collection (thicker cards) or the everyday collection. They're generously offering Frisco Kids readers a 20% discount, by using discount code friscogoosiekids20 when you checkout. The card below is the company owner and her son - yes, a mom came up with these! They are also sold through Walgreens, though I'm not sure the discount would apply there. These handmade hair clips and headbands by Cupcakes and Cuties make great stocking stuffers. My daughter has a few of the barettes (see the one she wears daily below). They're made by a mom I know who is awesome. She has many styles available, including butterflies, ballet, seasonal, flowers, princesses and more. Use code CUPCAKE when ordering and save 50%. Looking for a gift for the college student? Or you own kid's bedroom? Check out Stickr pockets, which require no nails, hooks or anything wall-damaging. It's not just a frame, it will hold momentoes and other items you want to stick in it. Plus you get a white board marker to personalize it. It's reusable! You've seen those wall sticker decorations that doesn't harm your paint or wallpaper? This is one of them - but it holds your stuff too. I was initially going to put the Chawel on my Stupid Products blog, but it sort of grew on me as I looked through the website. 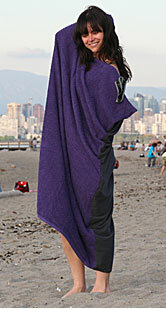 This is a beach towel that you can put on and change underneath (there are no arm holes) in public. You can also use it as a blanket (like a sleeping bag), towel, and the founder lists some other uses as well. The founder is a lifeguard (buff!) who got some funding after appearing on a reality TV show, the Dragon Den. There's a clip on the website and it's sort of entertaining. The Chawel traveler version runs $30 or $35 depending on size, and the sport version is $35 or $45. For those who travel a lot, the Space Bag to Go is a great (and inexpensive) gift. These are basically high-tech Hefty bags. 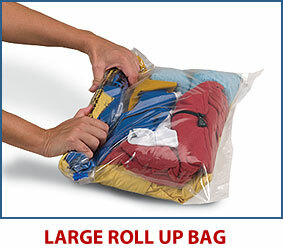 You pack your clothes in them (they come in various sizes) and squeeze the air out with their special system (you could probably do something similar with a Hefty of Ziploc bag, but it may be harder to get all the air out). The condensed bag allows you to have more packing space so you can fit more in your suitcase and make it easier to close. The company sent me two bags to try, and I actually wish they sent more (the bags hold less than they look like they'd hold). They did make packing easy because I just dumped the stuffed airless bag into the suitcase and didn't have try rearranging. Warning - when you click on the site, their commercial starts playing - it's annoying. Don't want to give a gift? Let your giver give charity to their own favorite with CharityChoice - where they'll choose from 250 charities. You give a CharityChoice gift card, and they decide where the money goes. I love this list! Kiwi Crate and Goosiecards are awesome!